I've not read a JW book since the age of about 10, but I've heard a lot about her 2015 re-telling of the 1872 'classic' and wanted to give it a try. Firstly I've got to kind of mention the established problem with the original- Katy Carr, of What Katy Did is a 12 year old American tomboy that's always in trouble and getting into scrapes. Long story short, original Katy has an accident that damages her spine and she's confined to her bed for four years. Bitter and angry at first, her period of invalidity causes her to learn patience, kindness and goodness, virtues that had always escaped her and becomes a saintly, shining example to her younger siblings. A terrible misfortune teaches her the error of her unladylike ways and her piousness is rewarded with recovery. You can see why JW wanted to retell the story. So. Katy. I LOVED Katy. I loved her energy and wildness, and her imagination. Having lived an adolescence head and shoulders taller than everybody else, I can also identify with her awkward, elbows and knees gawkiness. Sharp tongued and accident prone, she is often thoughtless and even her best intentions lead to disaster. Her family is huge and complicated- a dad, a full sister, a step-mum, a step-sister, two half brothers and a half sister, an ancient cat and an insane dog. Katy finds herself being unintentionally but satisfyingly mean to the simpering and attention-hungry Elsie, her step sister. Though she always resolves to be nicer, it never really works out and any good feeling is normally erased by mishaps and the inevitable tale-telling. Katy's relationship with Izzie, her stepmother is complicated too- as the only one who really remembers her mum, Katy never stops missing her and resents Izzie, she sees her as a betrayal of her late mum's memory and in intruder on her family. Katy's an immensely complicated character, written in a way that makes her instantly understandable and relatable. You just get her straight away. She tries hard to make people happy, but whatever she does to seem responsible or thoughtful or useful ends up backfiring and getting her into trouble. The first half of the book is warm and funny and flies by- we see Katy entertaining her hoards of siblings with imaginative games and stories, they compete for the attention of their busy Doctor father and we see their slightly haphazard, rough and tumble existence- it's a happy household, but there's a lot of friction and unspoken feelings. Phil, Dorrie, Jonnie, Clover and Elsie are all so full of character and laughs and you can't help but admire Katy's resourcefulness and knack with younger kids. 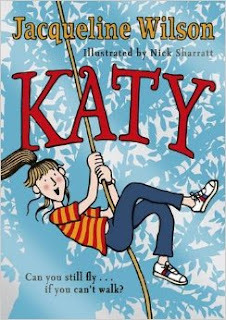 Katy loves to climb trees and skateboard, to plot against Elsie and Izzie and lead the 'littlies' off on wild adventures. Reading as an adult, it's kind of heartbreaking to see how torn Katy is between immersing herself in childhood games and fantasy and her awareness of her impending adolescence, and all the self-consciousness and fear that comes with it- it's nostalgic but at the same time I'm glad my teen years are way behind me. But when Katy has a horrible, unlucky, life altering accident, she must learn to adapt to her new challenges and new body and still try to stay Katy Carr.Being able-bodied I've no authority on the subject at all, but I think JW did an excellent job of showing the life of a recently disabled person. The anger, the bitterness, the wallowing, the feeling sorry for yourself but furious at the idea of the pity of others. The dwelling on all the things that you'll never get to do and the downright unfairness of it all. It all seemed incredibly real and affecting and really emotional. But Katy has in buckets the quality that I think I find the most impressive in people, and that's resilience. Though it costs her all her strength, she is determined to face school, stand up to the girls that have taunted her all through school, determined to have fun and bang heads together and wreak havoc. I loved the characters in this book- doodly angsty Dexter, angry at the world but he understands Katy and her pain in a way that nobody else can. Helen, the wheelchair bound academic that is loved universally and encourages Katy not to give up on life just because she's in a wheelchair. Ryan, Katy's friend that she's always avoided getting too involved with because she's so tall, him so short they'd look weird together (because everybody discriminates) Cecey, the best friend who has her wobbles but comes through, and Janine, the paediatric nurse that lets Katy earn her independence. The cast of characters in this book is incredible, they make you care so much and that's why it's such an affecting read. Also- JW you are amazing for the amount of sneak book recommendations you have covertly dropped in this book (Rooftoppers, The Chaos Walking Trilogy, Hunger Games to name a few). Also THANKYOUSOMUCH for having the school librarian be so amazing and offering refuge and support and strength through books. We're not all chignons and twinsets and a young, dynamic librarian that has *actual ideas about books* and not just a militant love of silence and order is a breath of fresh air. Just ordered this for work but I will be sneaking it home with me before it gets put on the shelves. Love a good JW story. And YAY for young librarians!! The librarian is a total hero in this book! Enjoy!